The first thing you need to realize is that you will need to have some idea of how to handle the paperwork associated with your business. Different structures come with different paperwork requirements. If you decide to stick with a sole proprietor organization, there is no paperwork at all — you just need to fill out your schedule C come tax time. If you decide to use a C-Corp or S-Corp structure, though, you might need other paperwork items, or you might need to set up other structures. Many business owners (myself among them) like the LLC setup because it requires a small amount of paperwork, but offers certain protections. Make sure you understand the requirements for registering your business in your state, and make it a point to understand what other paperwork, including payroll for employees, is needed. Do you plan on growing your business to the point that you will need to hire others or find facilities? You don’t have to start a business that will join the ranks of the Fortune 500 in order to be a success. However, if you plan to do so, you need to make sure that you choose a business organization that is scalable. In some cases, you can convert from one organization to another, but there are some organizations that don’t allow that. I’m happy with where I’m at because I don’t plan to hire a bunch of employers. I have a virtual assistant that is an independent contractor, but other than that, I don’t have to worry about scalability. Be realistic about your goals, and look for a business organization that will help you reach them. Make sure you understand your tax situation as well. Some business structures are considered “pass through.” That means that the business itself doesn’t pay taxes. Revenues/profits through to the business owners or partners, and then these individuals pay taxes on the income. Some business organizations allow you to set things up so that you pay yourself a salary so that you don’t have to pay the self-employment tax on the whole amount that you earn. There are also other ways to use your business organization to your tax advantage. A good talk with an accountant specializing in small business tax issues can help you identify the tax pros and cons of various business structures. Finally, you need to consider what kind of liability you will end up with. If you are a professional that offers advice, you need to be careful of lawsuits. If you are a sole proprietor, there is no difference between your assets and your business assets. If you are concerned about that state of affairs, it’s a good idea to set up some other business structure. By setting up a separate entity for your business, you provide yourself a way to protect your personal assets if someone comes after your business. Figure out the most common threats likely to affect your business, and then choose a business structure that will most likely help you deal with those threats while keeping your personal assets out of it. While it’s possible to use online resources to get help setting up your business organization, it can actually make more sense to sit down with a professional and get advice and help setting everything up. One of the best things I did with my business was to meet with an accountant and get information on how to structure my business. How much it costs depends on your state, and your business structure, and the accountant. I spent $150 to get my LLC set up with the help of an account, but it can cost thousands of dollars in some states, so be careful. The nice thing about sitting down with a professional, though, is that he or she can point you in the right direction by explaining the ins and outs, an ensuring that the paperwork is all properly completed. 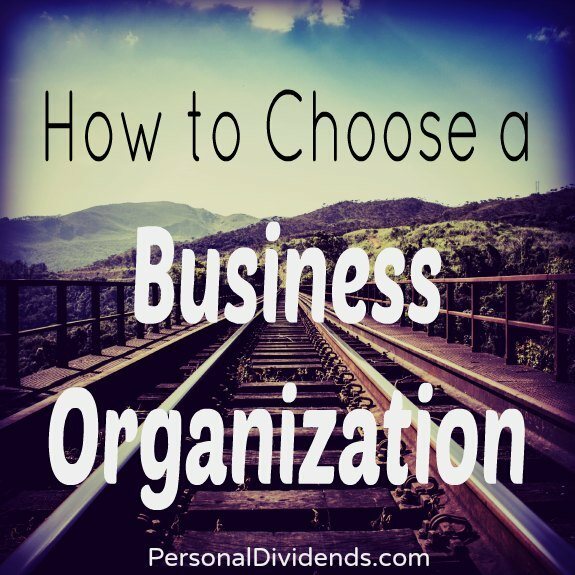 What business organization do you have, and why?